The Cape Cod Senior Softball League traces its roots back to 1987 when Joe Cassidy decided that it was time for senior softball on Cape Cod. We owe much to our early players and we have decided to have a league-wide tournament name the Cassidy Cup to honor those efforts. By clicking the document below you will be able to learn more about our origins and how we are making sure to keep the tradition alive! 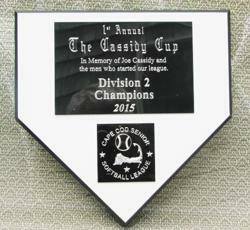 As we all know the Cassidy Cup is played in honor of Joe Cassidy, the founder of our League. The Division 1 championship was decided in extra innings on a run driven in by Joe's grandson, also named Joe Cassidy. This was a fitting way to decide the inaugural Cassidy Cup. 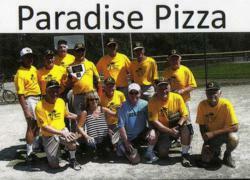 Paradise Pizza won the 2015 Cassidy Cup in Division 3. Here the team poses after the champion- ship game with the trophy and members of Joe's family. Congratulations to Paradise Pizza! ©2019 Cape Cod Senior Softball League / SportsEngine. All Rights Reserved.